Muggy Weld SSQ-6 is simple to use on brass–just squeeze out the amount needed on the brass before you heat the part with your choice of torch. 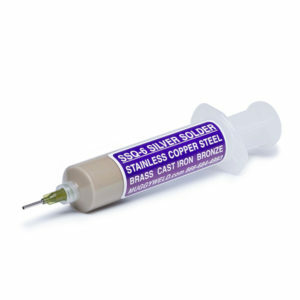 Apply SSQ-6 to cold brass, then heat the parent metal to flow the solder. Brass is an alloy of copper and zinc and has been used in the marine industry, radiators, heat exchangers, heater cores, oil coolers, musical instruments, and many other uses. We have 3 solders for brass: SSQ-6, SSF-6, and Super Alloy 1.